Rainforests wrapping cities, nature shaping culture. British Columbia is the kingdom of abundance. Mother Nature loves to show off and who could blame her? The Rocky Mountains, coastal islands, glacier-fed streams and the many forests where ancient trees reside are just a few examples of her handy work. Towering rows of mountains, wildlife-packed forests and a scenic coastline make Canada's westernmost province an ideal playground for nature lovers everywhere. Whether you're enjoying the slow pace of Victoria, the cosmopolitan buzz of Vancouver or duality of Whistler's summer and winter terrain, you will always hear the call of the wild that is never too far away. The diversity of BC’s topography and proximity to the Pacific Ocean largely influences the weather around the province. Peak travel time is May to October, although multiple mountain ranges and resorts offer top notch ski experiences in the winter. The west coast cities of Vancouver and Victoria experience the mildest winters in Canada making BC a great year-round destination. Travel from the shores of Vancouver to Victoria to Whistler and beyond. Bald eagles, bears, Orcas and more make their home in BC’s wilderness. Raw wilderness waiting to be discovered – wave-swept beaches and tranquil rainforest. Where vineyards blanket the hills on either side of glistening lakes. All the scenic charm and laidback vibe of an island getaway. A bastion of British ancestry, offering a surplus of world-renowned parks and gardens. 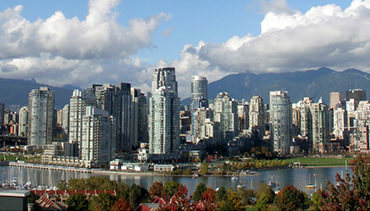 The Inner Harbour serves as the hub of BC’s capital city. Drive through winding routes along the rugged, steep beauty of the Sea-to-Sky Highway to Whistler. A four-season resort community naturally endowed with world-class skiing and hiking. Consistently named North America’s #1 resort, it’s not hard to understand why. The Okanagan Valley spreads abundance of vineyards and orchards along green, fertile hills, wrapping themselves around a chain of startlingly blue lakes, with views in every direction. The sun shines on sparkling lakes surrounded by soft sandy beaches, providing the perfect backdrop. BC’s best kept secret. An area of quaint, coastal communities, with locals who share their knowledge of the sea and terrain, enjoy fresh seafood caught minutes away. A Pacific paradise of quirky waterfront shops, friendly people and an easygoing lifestyle. Pristine wilderness and endless beaches. Imagine fishing, kayaking, whale-watching, bear-watching, hiking, surfing, storm-watching, and First Nations culture all in one place. Boasting swank beachfront resorts, excellent restaurants, and a dynamic arts scene. An extraordinary cosmopolitan city overflowing with world-renowned cuisine, shopping and culture. Whether strolling along the seawall, shopping on Robson Street or exploring historic Gastown, catch a glimpse of the Pacific Ocean or the rainforest-covered Coast Mountains. City experiences with a touch of the wild. Adventure in the trees or searching for whales, BC has it all. Fresh local bounty, talented chefs, and a melting pot of culture. Take a journey to see animals in their natural habitats. Discover BC’s unique cultural footprint through museums, totems and more. 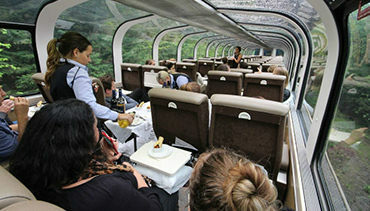 The unparalleled experience onboard Rocky Mountaineer’s all-dome fleet offers rich, historic storytelling, world-class cuisine, and a first-hand look at the vast and untouched wild beauty of the Pacific Northwest. Onboard, guests have the luxury of not having to worry about a single thing, and can focus on reconnecting with the things that matter – a true celebration of being in the moment. Ask one of our Flight Centre Travel Consultants for more details on special deals and to find the right itinerary for you.